When I talk to people about disabilities, many automatically think about the obvious, including mobility impairments and common sensory disabilities like blindness. There are a number of other conditions that are typically invisible to others. We recently hosted two combat veterans at our ADA Celebration Picnic who live with PTSD. By all appearances they are “normal”. 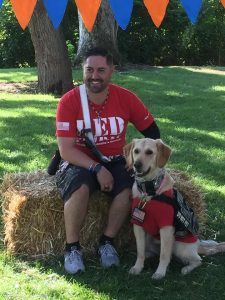 When current medication treatment wasn’t working for them, they received a service animal specially trained for PTSD. These animals make the difference for them to be able to participate in normal life activities and have a better quality of life. I for one had no idea what a service animal can do for PTSD. But they can help in so many ways! They can sense when their owner is having a episode and can signal and interrupt this behavior. They can remind them to take medication, retrieve objects, prevent people from crowding around or rushing up on the handler, can assist the person getting up off the ground, or provide stabilization when walking. They can be trained to recognize and interrupt night terrors, and can prevent the owner from sleep walking. They can watch their back, or give the all-clear signal. But for this therapy to work the public needs to understand. Yes, even though you can’t see the disability, they need to have their service animal with them. No, you may not pet the dog when it is working. This is very tempting, for who can resist a cute dog! But it’s very important for them to remain focused on their job. Rest assured, as these animals are also a household pet they get plenty of down and play time. So the next time you see someone with a service animal, and the disability isn’t obvious, give the benefit of the doubt. Trust that something special is happening with this human-animal bond. And let’s celebrate instead how life changing this can be!